I have been sticking to the theme of Pre-World War II baseball reading lately. I have been lucky enough to find some more material about that era and I have realized that it is a large deficiency in my baseball education. My knowledge hole if you want to call it that, starts in the late 19th century and ends in the late 1920’s or so. Today’s book falls right in the middle of that time frame and allows me to gain some serious knowledge of the era. Ronald T. Waldo has brought forth another winner in this era. For fans of early baseball he has produced a compilation of some great stories of baseball’s early years. From the games greats like Ty Cobb, and then the games not so greats like Arthur Evans, the author has regaled the reader with some very entertaining stories. He also does go beyond just the players. He includes Umpires, Owners and often forgotten names from this unique era in baseball history. Characters from the Diamond paints a unique picture of what baseball was really like during its early years. Perhaps during this era baseball was keeping more in-line with its original roots as being a form of relaxation and fun for the players and the masses. This is in contrast to the mega business powerhouse it is today. The picture this book paints helps keep a unique era in baseball’s history preserved in print, so as time marches on fans of the game will realize where the sport came from and how we got to where we are now at today. Author Ronald T. Waldo has really found his niche in this era. From his previously published books and now including this one he has undertaken measurable tasks with his books. He is working in an era that very few players, if any are still alive. Even people who witnessed the end of this era are few and far between, so he is trying to compile stories in the fourth and fifth person down the line. That is a monumental task for a writer. The pressure involved with fact checking and putting your name on the line that you got the story correct is monumental. As one is reading Waldo’s work you get the feel that the research is thorough and you are getting the complete story. That is both a compliment to his dedication and writing style. This is a very hard era to make the reader feel like they are actually there, but Ronald T. Waldo pulls it off. The main reason being that between alcohol and gambling alone the game of baseball on and off of the field is such a different game than what we are used to. Baseball fans should take the time to check this one out. It is a great history lesson for everyone, and an era where a few laughs up until now have been hard to find. It is also important for everyone to see where we have come from and be able to appreciate what we now have on the field. I don’t normally like to do two books in the same review, but I felt this case was different. These two books are both new releases by the same author and the subject matter is related, so I figured it would be safe to do them together. 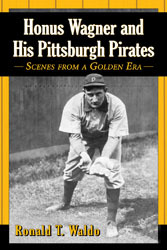 Ronald T. Waldo has just released two Pittsburgh Pirates books that are from an era that sometimes gets forgotten. In our current world of everything, right now, it is important to remember our history. In baseball much of that history is incredible but some of it gets forgotten due to the passage of time. The people involved in those eras pass on and we lose some of the first hand memories. Thanks to Ronald’s books Pirates fans can now delve deep into their past. Lets start with Honus Wagner and His Pittsburgh Pirates. I was expecting another basic biography about Honus Wagner. The like of which we have seen before, bu this was different. It was more of an anecdotal storytelling of Honus Wagner. It was giving you the details about the man himself, not just the on field personality. Enjoying life’s simple pleasures is not something you normally read in a baseball biography, but this one has it and it is a nice change of pace. You also see Wagner’s interactions with other players around the league and his feelings towards baseball in general. This book is a nice change of pace from the normal everyday baseball biography in the fact that it gives you views of the player himself. It shows the human side of Honus Wagner that many of us could never before relate to. Being he played so long ago, that human aspect gets lost to time. Through Ronald Waldo’s hard work and research, he is able to make Honus Wagner come alive for new generations of baseball fans. Waldo’s second book the 1902 Pittsburgh Pirates brings alive a team that I feel is also getting lost to the passage of time. When you think about great baseball teams the 1902 Pittsburgh Pirates do not, at least for me, immediately come to mind. 1902 being the middle year of a three-year pennant run is widely considered the best of those three teams. Again through Waldo’s exhaustive research you get great detail about a team that I think would be very hard to come up with information on. Outside of Pittsburgh, I think you would be hard pressed to find many people who are well educated on this team. This book shows the politics of baseball at the turn of the 20th century along with details of how the Pirates fortunes had changed for the better. 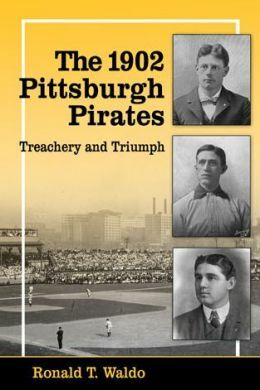 It also gives a nice review of how the entire season progressed for the Pirates and how they overcame players jumping to the rival American League. It is a great glimpse into the past when baseball operated nothing like what we accept as the norm today. These types of books have to be very hard to write since you are dealing with things that happened over 100 years ago. Ronald T. Waldo should be commended on his dedication to his subject and the effort he has put in to both of these books. It is authors like this that help keep the grand history of the game alive over a century later.